Samsung Galaxy S7, Samsung Galaxy S7 Edge and Samsung Galaxy S7 Active are Android smartphones manufactured and marketed by Samsung Electronics. The S7 series serves as the successor to the Galaxy S6, S6 Edge, S6 Edge+ and S6 Active released in 2015. The S7 and S7 Edge were officially unveiled on 21 February 2016 during a Samsung press conference at Mobile World Congress, with a European and North American release on 11 March 2016. The S7 Active was unveiled on 4 June 2016, and released on AT&T in the United States on 10 June 2016. According to a report from Strategy Analytics, the combined sales of the two smartphones reached 55 million units at the end of the first quarter of 2017. In the first three months of the year, the tech giant sold 7.2 million units of last year’s flagships. The Galaxy S7 is an evolution of the prior year's model, with upgraded hardware, design refinements, and the restoration of features removed from the Galaxy S6, such as IP certification for water and dust resistance, as well as expandable storage. Succeeding the S6 and S6 Edge+, respectively, the S7 is produced in a standard model with a display size of 5.1-inch (130 mm) as well as an Edge variant whose display is curved along the wide sides of the screen and also has a larger 5.5-inch (140 mm) display. The S7 Active features a thicker more rugged frame and an increased battery capacity. The Galaxy S7 and S7 Edge are the last two phones in the Samsung Galaxy S series to have a physical home button with a front-sided fingerprint sensor embedded in the button (the S7 Active being the last in the Active series to feature three physical buttons with the fingerprint reader embedded home button) and the last Samsung Galaxy S series phones to use MicroUSB charging. The Galaxy S7's hardware design is largely identical to that of the S6; Unlike the S6 though, Samsung has decided to remove the built-in IR Blaster due to low demand. The device retains its metal and glass chassis, but with refinements such as a square home button, and a thinner protrusion for the camera. Both models are available in black and gold colors; white, pink, blue and silver versions are available depending on market. As a Worldwide Olympic Partner, special editions of the Galaxy S7 Edge were released by Samsung for the 2016 Summer Olympics, with a dark blue body and hardware and software accents inspired by the colors of the Olympic rings. The devices were sold in limited quantities in selected markets, and were given to nearly all athletes participating in the 2016 Summer Olympics (the 31 phones meant for the North Korean team were confiscated by order of the country's government). In October 2016, Samsung announced a new light blue ("Blue Coral") color option, as previously offered on the recalled Galaxy Note 7. The S7, S7 Edge & S7 Active are IP68-certified for dust and water resistance; unlike the Galaxy S5, the ports are sealed and thus do not require protective flaps. The S7, S7 Edge & S7 Active feature a 1440p Quad HD Super AMOLED display; the S7 & S7 Active both have a 5.1-inch panel, while the S7 Edge uses a larger 5.5-inch panel. As with the prior model, the S7 Edge's screen is curved along the side bezels of the device. All three models (S7, S7 Edge & S7 Active) have larger batteries in comparison to the S6, with 3000 mAh, 3600 mAh & 4000 mAh capacity respectively and support for AirFuel Inductive (formerly PMA) and Qi wireless charging standards; however, the S7 does use MicroUSB charging. They also feature a 12-megapixel rear-facing camera with a "Dual Pixel" image sensor and f/1.7 aperture lens. Galaxy S7 devices are equipped with an octa-core Exynos 8890 system on a chip and 4GB of RAM in China. In the United States the S7 uses the quad-core Qualcomm Snapdragon 820; unlike Exynos, this SoC supports older CDMA networks that are extensively used by carriers in these markets. The heat from the processor is transferred with a 0.4mm thick water-to-steam heat pipe cooling system. The S7 includes either 32, 64 or 128 GB of internal storage (in most markets only the 32 GB model will be available). Storage can be expanded using a microSD card. S7 devices are packaged with a USB OTG adapter. It can be used with the included "Smart Switch" app to help transfer content and settings from a previous Samsung Galaxy device running Android 4.3 or later, iPhone running iOS 5 or later, or BlackBerry running BlackBerry OS 7 or earlier. The Galaxy S7 ships with Android Marshmallow (6.0) and Samsung's proprietary TouchWiz software suite. The new TouchWiz also allows the user to disable the app drawer. A new "Always On" functionality displays a clock, calendar, and notifications on-screen when the device is in standby. The display is turned off completely if the device's proximity sensor detects that it is in an enclosed space such as a pocket. Samsung claims this feature would only consume half a percentage of battery capacity per-hour. New widget panes can be displayed on the edge of the S7 Edge, in "Edge Single" and wider "Edge Single Plus" sizes. Android Marshmallow's "adopted storage" feature was disabled by Samsung and is not usable. An update in September 2016 added support for Vulkan, a new low-level graphics API. In January 2017, Samsung released an update to Android 7.0 "Nougat", which replaced TouchWiz with the current Samsung Experience software suite (introduced by the Galaxy S8). In the summer of 2018, the S7 and S7 edge received Android 8.0 "Oreo". 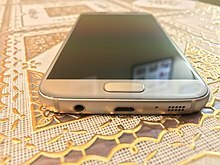 The Galaxy S7 received generally positive reviews with critics praising the return of the micro SD card slot and water resistance, while retaining the premium metal design of the preceding Galaxy S6. The design of the larger Galaxy S7 Edge was particularly praised, as its curved sides on the S7 Edge are used to "make the phone much narrower than it would be if it had a flat display. It makes the whole device smaller and easier to use. That becomes readily apparent when you put the S7 Edge next to other devices with 5.5-inch or similar screens" like the iPhone 6s Plus (5.5-inch) and Google Nexus 6P (5.7-inch). The quality of the primary (rear-facing) camera has been further improved, despite the megapixel decrease from 16 MP to 12 MP, it has larger 1.4-micron pixels and even faster focusing than its S6 predecessor. There was some criticism of the Galaxy S7, due to the removal of MHL support and the IR Blaster of the Galaxy S6, stock music and video player apps have been replaced by the Google Play equivalents, and the use of an "obsolete" Micro USB charging port instead of USB Type C.
The Exynos version is faster than the Qualcomm Snapdragon version at multitasking where there is a clear difference, as the Qualcomm version fails to keep as many apps in the background and takes more time to switch between apps. However, the Snapdragon version performs better in graphically intensive apps and games. iFixit gave the S7 a repairability score of 3 out of 10, noting an excessive use of glue and glass panels, as well as it being nearly impossible to service certain components of the device (such as the daughterboard and other components) without removing the screen, which is not designed to be removed, and that "replacing the glass without destroying the display is probably impossible". Between the Samsung Galaxy S7 and the Samsung Galaxy S7 Edge, approximately 100,000 devices were sold within two days of the official launch in South Korea. The Galaxy S7 had between 7-9 million units shipped in its first month. A total of 48 million units were sold in 2016. Galaxy S7 edge was the most popular handset from South Korean's 2016 lineup. The Galaxy J3, which is regarded as an entry-level device, found its place in the 6th most popular phone for 2016. The iPhone 6s had around 60 million shipments, whereas the Galaxy S7 edge and other phones from Samsung garnered around 25 million shipments. At release, videos recorded at high frame rates stuttered, with both Exynos and Snapdragon models suffering from the issue. A following firmware update claimed to fix "flickering video playback after recording". Some S7 Edge units have an irremovable vertical pink line on the display, which seems to appear at random. Samsung is offering free repairs/replacements for users in Belgium/Netherlands/Luxembourg (limited to those) under warranty given that the screen isn't externally damaged. It is extremely difficult to repair a broken screen. Removal of the AMOLED panel will be required if you do happen to break the screen. ^ "New info on the the Samsung Galaxy S7 active - code name Poseidon suggested - GSMArena.com news". Gsmarena.com. Retrieved 6 September 2018. ^ a b "Samsung Galaxy S7 Active now official; launching exclusively via AT&T on June 10". Thedroidguy.com. 6 June 2016. Retrieved 6 September 2018. ^ "Samsung Galaxy S7 camera sensors compared: Sony vs. Samsung". Retrieved 28 July 2016. ^ "See the Samsung Galaxy S7 camera and its blazing fast autofocus in action". PhoneArena. Retrieved 28 July 2016. ^ a b Zimmerman, Steven (12 October 2016). "Sony IMX378: Comprehensive Breakdown of the Google Pixel's Sensor and its Features". XDA Developers. Retrieved 17 October 2016. ^ Ho, Joshua. "The Samsung Galaxy S7 and S7 edge Review: Part 2". AnandTech. Retrieved 10 November 2016. ^ a b c d e f g "Samsung Galaxy S7 and S7 Edge: Curvier, faster, micro SD expansion—available March 11". Ars Technica. 21 February 2016. Retrieved 21 February 2016. ^ a b c d e f "Samsung's Galaxy S7 and S7 Edge bring refinement to a proven design". The Verge. 21 February 2016. Retrieved 21 February 2016. ^ "Samsung Galaxy S7: 5 Things you may not know about Samsung's new flagship". Android Beat | Android News, Hacks, Apps, Tips & Reviews Blog. 22 February 2016. Retrieved 12 July 2017. ^ "Samsung Galaxy S7 and Galaxy S7 Edge Review". Retrieved 28 July 2016. ^ "Samsung Galaxy S7 goes for gold (with pink)". CNET. Retrieved 28 July 2016. ^ "North Korea won't let Olympic athletes accept Galaxy S7 phones". CNET. Retrieved 1 September 2016. ^ "Samsung's special-edition Olympics phone splashes out with color (hands-on)". CNET. CBS Interactive. Retrieved 1 September 2016. ^ "The Galaxy S7 Edge gets doomed Note 7's Coral Blue outfit". Engadget. AOL. Retrieved 1 November 2016. ^ Sacco, Al (22 February 2016). "Galaxy S7, GS7 edge support 15w Qi wireless charging, but ..." CIO. IDG. Retrieved 18 November 2016. ^ "Everything you need to know about wireless charging". TechHive. 2 September 2016. Retrieved 29 March 2017. ^ "Samsung-powered Galaxy S7 suffers from sluggish GPU". ZDNet. Retrieved 1 September 2016. ^ "What chip will your Galaxy S7 or S7 Edge have?". PC World. 21 February 2016. Retrieved 21 February 2016. ^ "MWC 2016: Samsung Galaxy S7 restores expandable storage". BBC News. 21 February 2016. Retrieved 24 February 2016. ^ "Use Samsung's Smart Switch to quickly set up your Galaxy S7". CNET. CBS Interactive. Retrieved 21 March 2017. ^ James Rogerson. "Samsung accidentally confirms the Galaxy S7 Edge". TechRadar. Retrieved 16 February 2016. ^ "The LG G5 and Galaxy S7 won't support Android 6.0's adoptable storage". Ars Technica. 23 February 2016. Retrieved 25 February 2016. ^ "Samsung Galaxy S7 finally receives support for the Vulkan graphics API". PhoneArena. Retrieved 21 March 2017. ^ "Samsung Pass to let you access your financial apps via your irises". CNET. Retrieved 1 September 2016. ^ "Samsung brings Android Nougat to the Galaxy S7 and S7 Edge". Engadget. AOL (division of Verizon). Retrieved 26 February 2017. ^ Beavis, Gareth. "Hands on: Samsung Galaxy S7 review". techradar. Retrieved 2 March 2016. ^ Martin, Chris. "Samsung Galaxy S7 review: The best phone of 2015 just got even better for 2016 with most of our prayers answered". PC Advisor. Retrieved 2 March 2016. ^ "Samsung Galaxy S7 review: on the edge of perfection". The Verge. 8 March 2016. Retrieved 6 September 2018. ^ Savov, Vlad (10 April 2017). "Samsung's Galaxy S7 Edge is still a great phone, and now great value thanks to the S8". The Verge. Retrieved 6 September 2018. ^ P., Chris (24 March 2016). "Is the camera of the Galaxy S6 better than Galaxy S7?". Phone Arena. ^ Martonik, Andrew (21 February 2016). "Galaxy S7's camera drops to 12MP, picks up 1.4-micron pixels and even faster focusing". Android Central. ^ "I think I want the IR blaster back on Samsung devices". SamMobile. 13 March 2016. ^ P., Daniel (8 April 2016). "Are you missing an IR blaster on the Galaxy S7 and S7 edge?". Phone Arena. ^ Tyson, Daniel (5 March 2016). "PSA: Samsung dropped the IR blaster on the Galaxy S7/Galaxy S7 Edge". Ausdroid. ^ "Samsung's removed its Music and Video Player apps from the Galaxy S7 and Galaxy S7 edge". SamMobile. 22 February 2016. ^ "New Photos of Galaxy S7 Edge Confirm Samsung Hates USB Type-C". Droid Life. 18 February 2016. Retrieved 13 July 2017. ^ "Samsung Galaxy S7: Exynos 8890 vs. Snapdragon 820 speed test". Retrieved 28 July 2016. ^ "Samsung Galaxy S7 edge review: Performance". M.gsmarena.com. Retrieved 6 September 2018. ^ "Samsung Galaxy S7 teardown: Cracked glass likely and glue galore". Retrieved 28 July 2016. ^ "100,000 Samsung Galaxy S7, S7 Edge Units Sold in First 2 Days in South Korea: Report". NDTV Gadgets360.com. 14 March 2016. Retrieved 2 June 2016. ^ Dilger, Daniel Eran (16 May 2017). "Samsung's 5 million Galaxy S8 sales far below 2014's S4 peak". AppleInsider. Retrieved 1 June 2017. ^ "Samsung almost doubles first shipments of Galaxy S8: report". Theinvestor.co.kr. 13 February 2017. Retrieved 6 September 2018. ^ "Apple's iPhone Was the Most Popular Smartphone in 2016, But Which Model Exactly?". Tech CrunchX. Retrieved 30 September 2018. ^ "Samsung rolls out update for Galaxy S7/S7 edge, very specific bug fixes this time". Retrieved 28 July 2016. ^ Gordon, Scott Adam (25 January 2017). "Samsung Galaxy S7 Edge owners report "pink line" display problem". Android Authority. Retrieved 3 January 2018. ^ Aldershoff, Jan Willem (24 January 2017). "Samsung: We'll repair S7 Edge problem with vertical pink line on display under warranty – if your screen is OK". Myce. Retrieved 3 January 2017. ^ "Seriously, don't break your Galaxy S7 edge". SlashGear. 11 March 2016. Retrieved 2 October 2018.